Julius Lothar Meyer was born on August 19, 1830 in Varel, which at the time was part of the Dutchy of Oldenburg, and is now part of Germany. He was the fourth of seven children of a physician and his wife. He began his education with the intention of following his father in his career choice and after high school he studied medicine first at Zurich University and then at the University of Wurzburg. He qualified in medicine in 1854. After graduation, interested in physiological chemistry, Meyer worked at the University of Heidelberg, where Robert Bunsen was the chemistry department chair. He earned his Ph.D. from the University of Breslau in 1858, completing a thesis on the action of carbon monoxide on blood. The following year he became a privat-docent in physics and chemistry at Breslau. 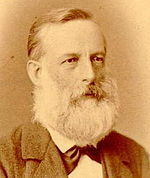 In 1866 Meyer became professor of chemistry at Karshule Polytechnic and in 1876 he became the first professor of chemistry at the University of Tubingen, where he remained until his death. Meyer is chiefly remembered for his contributions to the development of the periodic table of elements. In 1864 Meyer published Die Modernen Theorie der Chemie, a chemistry textbook that went through five editions and was translated into English, French, and Russian. Included in the book was a table of 28 elements arranged by increasing atomic mass. Meyer was the first to identify the periodic (repeating) nature of the elements. Periodicity means that chemical elements of different sizes can have similar properties and those properties are repeating in that elements listed on the periodic table in groups (vertical columns) have similar chemical properties. Meyer's publication preceded Dimitri Mendeleev's periodic table (from which the modern periodic table was developed) which was not published until 1869. Like Mendeleev's table Meyer's table has empty spaces for elements that had not been discovered yet. Meyer is also known for being the first to predict that benzene had a cyclic shape, although he did not predict the alternating single/double bonds found in benzene, that were later described by August Kekule. In 1882, Meyer (with Mendeleev) was awarded the Davy Medal by the Royal Society of London. Meyer died on April 11, 1895.